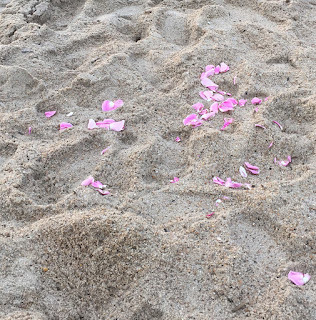 When I saw these rose petals strewn about the beach, my first thought was not about the happy couple who had probably gotten married there the previous evening and then been showered with the rose petals. My first thought was about the wonderful climbing rose my dad grew along the fence in our backyard. It was a wonderful, marvelous, magical pink blooming rose which put all its energy into one big burst of the rosiest roses I've ever smelled. Then all at once, it would drop every petal, covering the ground beneath it. I surely did love to walk through those petals, kicking them up with my feet, smelling the rosy scent. It was a tiny bit of heaven in our backyard, for at least a day or two until the petals got chopped up by the mower. Such a grisly end. My apologies. I do love a good petal drop. 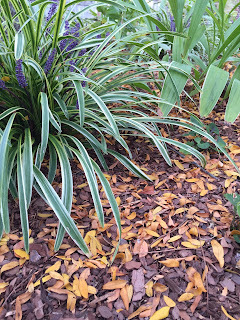 Not all flowering trees and shrubs have a good petal drop. My crabapple has a good petal drop. Just imagine, because I'm too lazy to find a picture, tight dark pink buds fading to a blush of rose and then dropping in a gentle rain of petals, covering the ground beneath. I love when it happens and because there is no lawn beneath the crabapple tree, I can leave the petals and let the garden fairies scurry around and take however many they want to take. Because you know that's what happens when petals fall to the ground like that. They attract the garden fairies who take the petals for all manner of uses... clothing, hats, bedding. Imagine finding enough rose or apple blossom petals to stuff your mattress full? 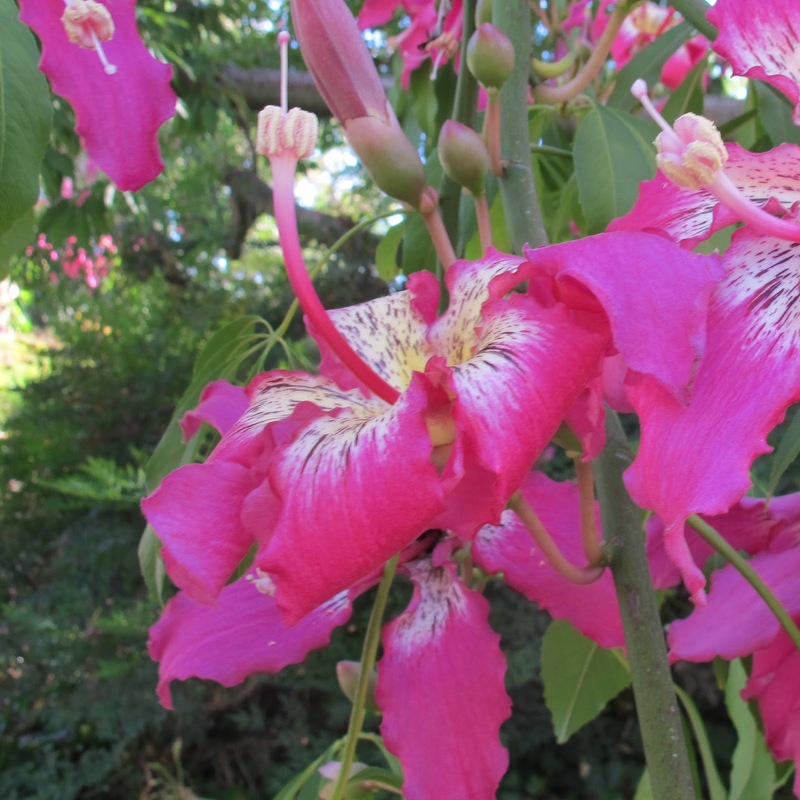 Out in that strange land I visited last week, that place called California, I found a nice petal drop from a pink floss tree, Chorisia speiosa 'September Splendor'. The blooms up close are not too shabby either. Dear friends in any zone other than 9b - 11, we can just forget about this tree for our gardens, lovely as the flowers and petal drop may be. Not even I would be foolish enough to plant such a tree and hope for the best. 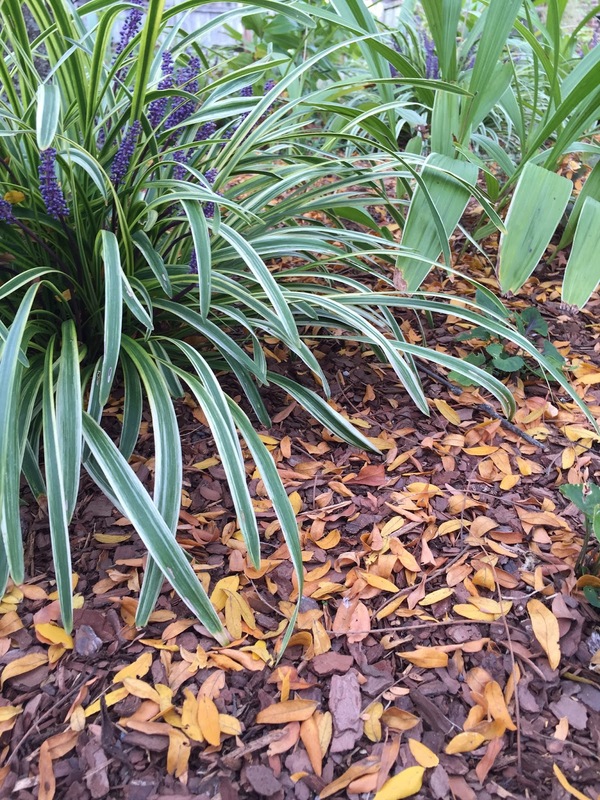 But there are other trees and shrubs with good petal drop. 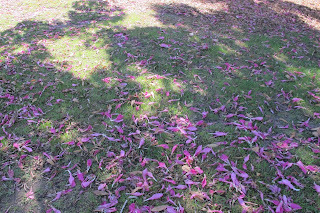 And we have falling leaves beginning in late September, so who needs pink floss trees? Yes, leaves can be pretty on the ground, too, like the lovely golden leaves of my honey locust tree, Gleditsia triacanthos, falling now. Well, they are sort of pretty, in a fall-like manner. Maybe, clearly, not as pretty as the petals of the pink floss tree, but that's all I've got right now, so I will make do. But this coming spring, there will be petal drops galore. I can hardly wait, for a I do love a good petal drop. And so do the garden fairies. Isn't it funny the things that trigger fond memories? These petal drops always set off my imagination. Garden Fairies and Garden Gnomes at work for sure. I do love petal drop, especially under my camellias in the winter when noting else is blooming, I can savor them all the way down! There are few things that I love more than the pink snow that falls from my three crabapple trees! I appreciate a good petal drop, just as you do. As long as the garden fairies are happy.